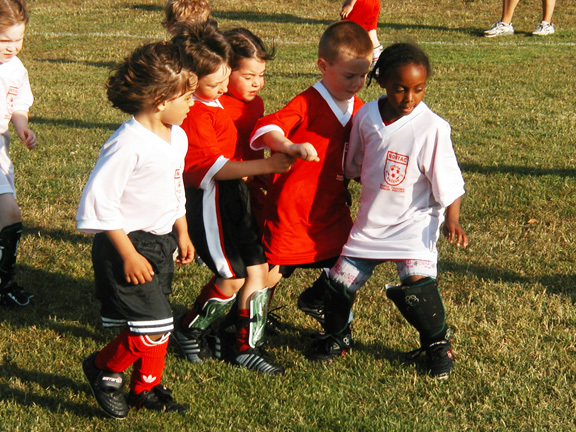 Our reversible socccer jersey is a great choice for recreational teams and programs. Dual-layer design of polyester mini-mesh offers both home and away versions in one jersey (all reverse to white, except red/black). Reinforced double-needle stitching, rib-knit neck and banded sleeves. Numbers will be in white on colored jersey side, and in black on white side unless otherwise noted. Call toll free 1-888-411-3687 to order or for more information. I used these for my 5 year old son's soccer team! It was so nice to have a reversible jersey so you never have the wrong color jersey when you get to the field. The quality of this jersey is wonderful and the customer service is unbeatable. I would order again and again! Awesome yet simple design. Very functional and breathes easily. Have already played several games and is seeming to hold up so far.